Air compressors convert energy, usually electrical, or petrol supplied, into a stream of compressed air. The air can be used in a range of applications, generally defined as industrial and commercial and domestic. Providing compressed air in a variety of situations means buying a compressor that can be moved from location to location and that, as they say is 'where the rub is'. What this means is: you need the best portable air compressor - but how do you find out which one is really the beez neez? 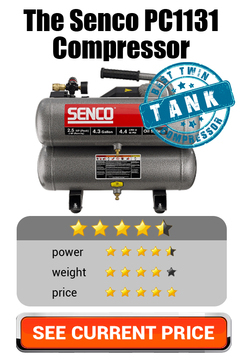 Easy - read the following portable air compressor reviews! Making an air compressor portable often means trade-offs in terms of how much compressed air can be provided. Before making a purchase, avoid expensive mistakes by understanding some straight forward ways of assessing the benefits of a given model. Portable air compressors offer the convenience of compressed air, wherever it is required. Often used in construction and auto-mechanics, they can also be extremely useful in domestic situations. 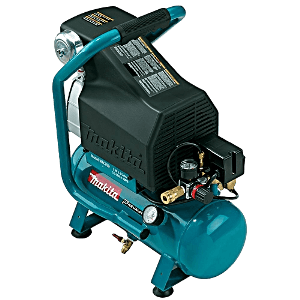 As with most things, there is an element of trade off when buying a portable air compressor and that is generally the area of the amount of compressed air they can supply. 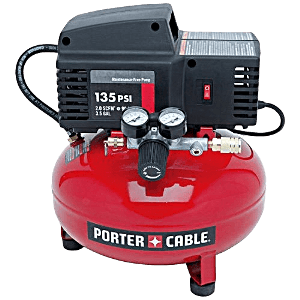 Before making a purchase, and some do come with quite hefty price tags so you need to get your choices right, a straight forward way of assessing what a particular portable air compressor is capable of, is most helpful. Start basically, by considering the size of the compressor, or how you can actually manage to port it as portability is not all it may seem at first. 3. Tank Size and CMF - How Much is Enough? If you are really spoiled for choice, your buying decision should come down to how much compressed air a given compressor can supply. There are two things to consider. Tank size, measured in gallons (sometimes in litres) determines how long a compressor can keep a tool running for. Larger tanks might sound ideal but they will affect how portable your portable compressor is and they will definitely determine how much space you need to work in. CMF – cubic feet per minute is the measure of how much compressed air can be supplied by the compressor, compare it with the tools you plan to use. Most will draw between 4 and 8 CMF. When using multiple tools, make sure your compressor supplies 1 – 2 CMF more than your tools are rated at. You’d be wise to test out every portable air compressor on the market before you buy, however you’d spend too much time, and money, doing so. 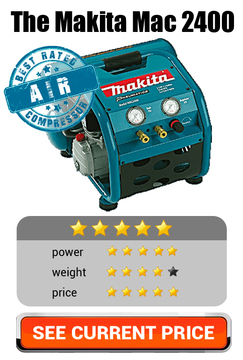 There is an easy way to find the best portable compressor however – simply read the following reviews. The following 4 compressors are super portable and have been voted as the best in the biz year after year. Despite its very compact design the Porter-Cable PCFP02000 is designed to provide compressed air at 135 psi – surprisingly high for its size that is powered with an electric motor providing just 0.8 hp. The compressor is carefully designed to support durable oil free operation which means that despite its size, you can expect it to deliver a long working life. With a small compressor, air delivery needs considering if you are planning to use it in a commercial situation. Multiple tools can be connected by the sum of all drawn from the tank needs to be up to 2SCFM at 90psi or 3 SCFM at 40 psi. SCFM requirements above these levels would need a more powerful compressor. The Verdict - Small is size and stature, this little compressor is still powerful enough to get small jobs done easily. While it won’t drive an air tool on a construction site it will certainly inflate a new tyre or drive smaller tools such as nailers or staplers. Quick coupling also means it is possible to connect multiple general inflation, smaller air tools, and blowing devices to the compressor at the same time. Driven by a small but mighty motor, the Makita MAC 700 is powered by an engine that runs at a surprisingly low 1,720 RPM so less vibration, less noise and of course, less maintenance due to lower wear and tear. The lower RPM is compensated for by a longer stroke on the single cylinder so the air pressure produced is very usable. Despite its 2HP rating the motor only draws 12.4 amps so is less likely to cause annoying trips on your circuit breakers every time you use a power tool. 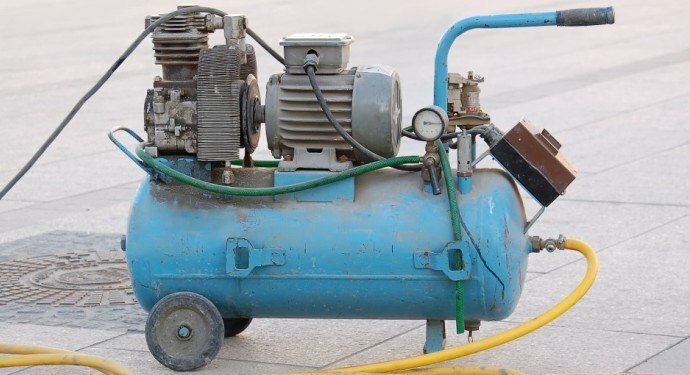 Despite the heavy weight, it is a neatly designed compressor with a small footprint and a rugged carrying bar securely welded to the tank which means it can be used in the smallest of spaces. The Verdict - With its size specifications and power ratings the Makita MAC 700 is ideal for home and garage use where low noise levels mean less disturbed neighbours. On construction sites, the fast fill and recharge times mean it will ably handle whatever is thrown at it on site. Now you’re talking! The Makita Mac 2400 is designed to deliver air in bucket loads (if that’s possible0 and it certainly does. Clever engineering means that just 1720 RPM is enough to provide 4.2 cubic feet per minute at a punchy 90 psi. Higher capacity means that the compressor needs additional features to ensure it operates at optimum performance. 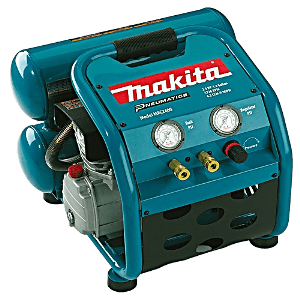 Makita have cleverly included an air filter into the design to ensure less wear and tear on the cylinder and a neat valve drainage system to enable draining off of condensation that builds up in the tank. Engineered for high output with low maintenance, this compressor also operates at low levels of noise so it means you will be an easy to live with neighbour if you employed it on your construction site. The Verdict - This is not a compressor for the feint hearted. Its weight and output specifications mean it is almost certainly over engineered for domestic situations. It comes into its own in commercial situations where the power and rugged metal construction (which is why it is so heavy) mean it will handle whatever power tools are connected to it and it is tough enough to survive the knocks and scrapes that it will encounter on a construction site. 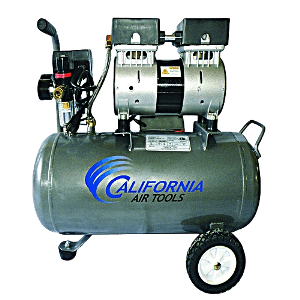 Designed to be one of the quietest compressors on the market, the California Air Tools 6310 Ultra Quiet air compressor makes less noise than your average conversation because of its powerful motor. Electrically driven. It only runs at 1680 RPM which means less noise and less wear and tear as well. Running at a low 1680 rpm could mean problem with the levels of air produced if it weren’t for the dual cylinder compressor. The motor is also rated for a sturdy 3,000 hours runtime which gives it an above average duty cycle compared to similar compressors. The motor and cylinders sit atop the air tank which gives It a rather Heath Robinson look but who cares about style in the garage or workshop? The Verdict - If you are looking for an air compressor that will have minimal impact on the neighbours then you’ve found your compressor. Designed to produce less noise than the average conversation it still packs a powerful blast of air and it sports a tank that holds a full 6.3 gallons of compressed air. Weighing in at just 49lbs, its wheelbarrow construction makes it easy to move from location to location so it can meet a wide variety of needs. After reading the above information you should have a great idea of how to find the best portable air compressor for your specific needs. We wish you luck with your new, lightweight machine! More air compressor reviews and information can be found right here.